Carl Linnaeus' parents wanted their son to enter the priesthood, a noble profession in the 18th Century. Linnaeus, like many children, rebuffed his parent's desires and followed his own interests. In doing so, he created the foundation of modern zoology. Carl Linnaeus wrote the Systema Naturae, an early attempt to classify life on Earth. Though he was trying to be as scientific as possible, Linnaeus nevertheless included several cryptids, or mythical animals, in his taxonomies of "suspect" animals. This list would later prove doubly interesting as several of the suspect animals are now known to exist. Linnaeus' family initially sent him to school to pursue the priesthood, but his studies ventured further and further into botany and medicine. He quickly became a popular lecturer, botanist, and physician. In time, Linnaeus turned to the systematic classification of the living creatures, forming the foundation of modern zoology by writing and editing the Systema Naturae. Linnaeus also converted the Celsius scale to its modern form along the way. Swedish by birth, Linnaeus wrote the Systema Naturae in Latin, akin to how modern scientific papers are overwhelmingly written in English regardless of the source country of the authors. Initially published as a twelve page leaflet in 1735, Carl Linnaeus' Systema Naturae is a gargantuan attempt to systematically break down and separate the organisms within the animal and plant kingdoms. Linnaeus turned a critical eye to his previous work and boldly made changes, with a superb example coming in the reclassification of whales as mammals and not fish in later editions. Linnaeus' greatest achievement, the Systema Naturae separated animals, plants, and minerals into three separate kingdoms. Linnaeus constantly added to the the text, including further classification dividing creatures into class, order, genus and species to make for a five point classification system. Linnaeus included a variety of animals in the Systema Naturae with questionable data supporting their existence. He deemed these creatures Animalia Paradoxa; populating the list from the reports of explorers, stories passed down through the centuries, and literature. Among these suspect animals is the hydra, a multi-headed, snake-like creature. The mayor of Hamburg, Germany believed he owned the taxidermied head of a hydra. Upon examination, Linnaeus found the creature to be a fake, featuring the heads of several animals glued and sewn together. The mayor of Hamburg hoped to sell the preserved hydra for a large sum of money, leading Linnaeus to flee the city in fear. Included in this list of unusual and suspect animals are tiny frogs that revert back to tadpoles and a plant that grows sheep as fruit. Mythological creatures like the phoenix, sirens, dragons, and the Sphinx-like manticore also make Linnaeus' cut. Several creatures included in the list of Animalia Paradoxa are now known to be real, including the pelican, antelope, the barnacle goose, the death watch beetle, and the narwhal. The list of Animalia Paradoxa only survived the first five editions of Linnaeus' Systema Naturae, one of the many edits Linnaeus made to improve the text. The 10th edition is particularly beloved and viewed as the beginning of modern zoological nomenclature. The twelfth edition of System Naturae would be Linnaeus' last. By the time of its printing, the twelve page leaflet became a two thousand plus page text. 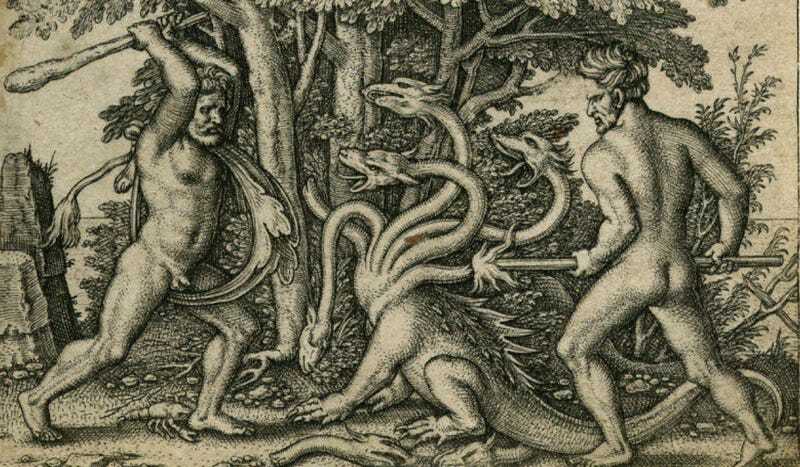 The top image, from 1545, features Heracles fighting the Lernaean Hydra, by (Hans) Sebald Beham. The painting Carolus Linnaeus in Laponian costume is by Hendrik Hollander and within the public domain, as is the image from Systema Naturae. Sources linked within the article.